If you are searching for demo websites to practice Selenium Webdriver Online, then take a pause and check out the seven sites that we’ve picked for you. These sites are completely free and give you the right platform to pre-validate your tests before you run them in production. Also, we’ve compiled a list of step by step tutorials for you to learn Selenium. We recommend you to go through it and fill any gaps you may like to fix without any delay. Whether you are a beginner in Selenium or using it for quite a time, you’ll need a platform to learn and test the automation artifacts. Hence, we tried to bring in a list of demo websites where you can practice Selenium webdriver online, write and execute your test scripts. All of you will find the list incredibly useful as you can dry-run the tests and check if there is an issue with your code or locators. With these demo sites, you can automate a login page, online registration forms, and automate flight booking, etc. For testing e-commerce sites, we also added a few demo sites which help you simulate the e-commerce transactions. All these demo websites could be an excellent platform for you to learn and practice. Also, you can conceive a no. of test scenario to automate after looking at the functionality each website provides. Since you are now getting curious to know about the online sites to test Selenium webdriver, so let’s check them out one by one. 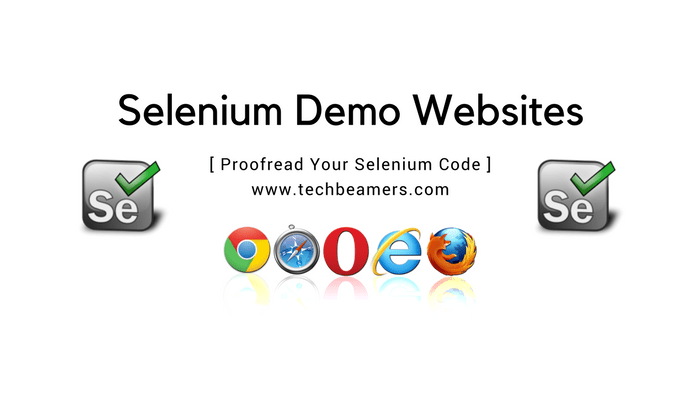 This demo site is a brilliant online resource to learn and exercise Selenium webdriver. You can prepare test scripts, test data, and object properties accordingly. It provides you with multiple options, listed a few of them below. Please note that the demo usernames and passwords are available on the demo page. This site offers web pages where you can test online booking for hotel, flight, tours, and travel. It even lands you a login page which takes email id as the username. It is a lightning fast demo website to practice Selenium webdriver online. Here you can perform the following web operations. Presents a web page to add a user. It displays the success/failure message on the screen. It will give a login screen with username/password fields. You can use the “test” as username and “test” as the password. It asks you to log in first before presenting the online flight booking web page. The demo username/password is test/test. It has a Flight Finder to search for the lowest fare on different airlines. You can try to book a flight and can set preferences for economy/business. Another awesome website to practice Selenium webdriver online. It gives you so much to test that whatever we write but it would feel incomplete. Still, check out the below list for a quick reference. You can test different UI actions like draggable, droppable, resizable, selectable and sortable. You can play with dynamic content, controls, and elements displayed at run-time. It’ll prompt with a variety of frames and windows. And will also present drop-downs and alert boxes. Test file download/upload, form authentication, and a floating menu. It’s a full-featured e-commerce website simulator. Here you can test anything from a simple login page to product selection and add/edit your shopping cart. It covers the complete online shopping workflow. You can write Selenium scripts to fill address, shipping details, and proceed to simulate payment. It is an excellent site for online Selenium practice. It has a rich set of web UI functions specially designed for the needs of testing of web application of all types. Some of the operations on the web elements that you can perform are. Last but not least, let’s have a site which is a demo HR management site. You can write Selenium webdriver scripts to validate various users and access level test cases from this application. To begin testing the selenium scripts, you can use the following credential for login purpose. You can test all of your Selenium webdriver stuff covering login, menu navigation, dropdown, and many more things. You can also implement the page object model and use this site for demo purpose. We’ve drilled down many demo sites which are functional and can be handy to practice Selenium webdriver online. Hope, the article would have struck you the same way we’ve thought. If you are also aware of any Selenium test link, then please do send to us by using the comment box so that we can add it to the list. Also, please do share this important article with your friends and don’t forget to follow us on our social media (Facebook/Twitter) accounts. Why Should You Run Selenium Tests in Cloud?